For quite a long time, the benefits of using marijuana as a drug have been controversial. There are many studies that have been published to try and figure out whether it’s possible to use marijuana for medical reasons or not. Even today, there are some physicians who are not convinced that marijuana can be used for anything other than recreation. • It can elevate your mood. This is important considering that some medical conditions can result in depression. Due to the above reasons and a few others, a number of states have now legalized the use of medical marijuana for various conditions such as cancer, neuropathy, AIDS, glaucoma and AIDS. This means that if you suffer from any of these conditions or any other chronic medical condition, growing your own medical marijuana might be a good idea. Once you decide to grow medical marijuana, the first thing you need to attend to is finding out if you will actually need it. It’s important to do some research to ensure that you don’t end up spending time and money on the project and then not benefitting from it in the long run. One of the ways of finding out if the marijuana will help is by consulting your physician. However, you should keep in mind that there are some who might be against the use of marijuana for medical reasons, even if it might actually help you. This means that you might need to get opinions from several of them before making up your mind. A very good way to find out if you can benefit from medical marijuana is by consulting people who suffer from the condition similar to what you have, and who have used marijuana on account of this. This will go a long way in helping you figure out whether to expect much from it or not. Some of the data you can get from this includes the exact benefits you will reap from the marijuana as well as how you should use it to reap these benefits. The importance of doing all the above is having a clear understanding of what to expect by the time you start growing the marijuana. The use of marijuana is legalized in many states in the country, so growing it might not be a major issue for you. However, if you live in a state that does not allow the use of recreational marijuana but still allows it to be used for medical reasons, you need to find out what legal issues you need to address when growing it. • The amount you are allowed to grow: In most states that allow you to use medical marijuana, you will be limited as to the amount of marijuana you can grow. Find out what this limit is in advance to avoid prosecution in future. • The permits you need: You might also need to apply for specific permits to allow you to grow the marijuana. You need to be very clear about how they work. Some of the details you need to find out include what they entitle you to as well as how frequently you should renew them. Once you get the permit and are sure that you will benefit from the marijuana, you will then need to figure out which conditions you should grow the marijuana in. There are various ways of optimizing the environment in which you grow the plants including through the use of artificial lights and portable greenhouses. You might also need to ensure that the soil you grow them in is pH balanced as well. 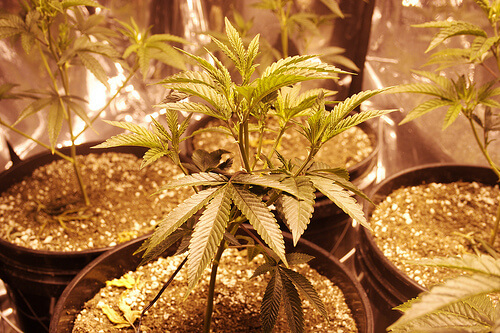 The conditions that suit the growth of the marijuana often depend on the type you end up growing. You might need to do a bit of research into this to get the specific details on how to grow the marijuana in the right conditions. It is important to be clear about the best conditions in which to grow the marijuana before actually starting to plant it. This is to ensure that you make the necessary arrangements to avoid the risk of having the plants not thrive as well as you would want them. In summary, though there might be a bit of controversy surrounding the issue, you are likely to find that the use of medical marijuana will help a lot particularly if you suffer from a chronic condition. If you intend to grow it yourself, following the steps above will enable you to do it with ease.